Assessing the degree of aromaticity in a novel compound has been a much sought after prize, and is the topic of much of Chapter 2 in my book. 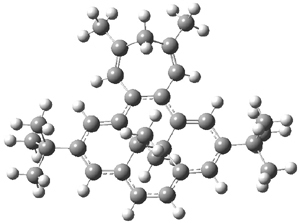 An interesting approach is described in a recent JACS paper by Williams and Mitchell.1 The interior methyl groups of 1 sit above and below the ring plane of the aromatic dihydropyrene and provide an interesting magnetic probe of the aromaticity; the chemical shift of these methyl groups are δ -4.06ppm, far upfield as they sit in the shielded region above the aromatic plane. 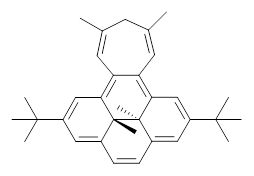 Annelation of a benzene ring to give 2 should reduce the ring current, thereby reflecting a reduced aromatic character. In fact, the chemical shifts of the methyls in 2 are δ -1.58 ppm. This relatively large chemical shift difference provides a means for measuring the aromatic influence of other fused rings. 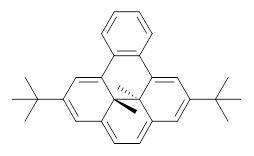 Suppose a different (non-benzene) ring were fused onto 1. Williams and Mitchell examined two such cases 3 and 4 (among others). These two compounds were prepared and studied by 1H NMR and also by B3LYP/6-31G* computations. The optimized structures of 3 and 4 are shown in Figure 1. The experimental chemical shifts of the interior methyl groups are δ -3.32 ppm. This downfield shift of the methyls relative to their position in 1 reflects some homoaromatic character of the cycloheptatrienyl ring. If we take the difference in the methyl chemical shifts in 1 and 2 to reflect the aromatic character of benzene (2.48 ppm), then the difference in the chemical shifts of 3 and 1 (0.74 ppm) indicates that the cycloheptatrienyl ring has 0.74/2.48*100 = 30% the (homo)aromatic character of benzene! 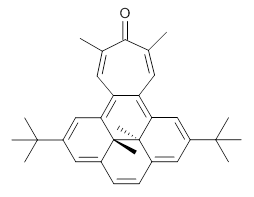 Similarly, the methyl chemical shifts in 4 are δ -3.56 ppm, leading to an estimate of the aromatic character of the tropone ring of 20%. Figure 1. B3LYP/6-31G* optimized geometries of 3 and 4. In using NICS to estimate the aromatic character, they make use of the average value of the NICS in the four rings of the dihydropyrene fragment. The baseline comparison is then in the average NICS value of 1compared to that in 5, a compound that has a similar geometry but without the aromatic character of the fused benzene ring. This difference is 11.42ppm. The analogous relationship is then 3 with 6 (a NICS difference of 3.81 ppm) and 4 with 7 (a NICS difference of 2.77ppm). 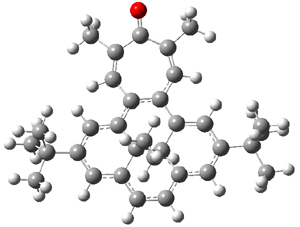 This gives an estimate of the (homo)aromatic character of cycloheptatriene of 33% and the aromatic character of tropolone of 24%. This NICS estimates are in great agreement with the experimental values from the proton chemical shifts. (1) Williams, R. V.; Edwards, W. D.; Zhang, P.; Berg, D. J.; Mitchell, R. H. "Experimental Verification of the Homoaromaticity of 1,3,5-Cycloheptatriene and Evaluation of the Aromaticity of Tropone and the Tropylium Cation by Use of the Dimethyldihydropyrene Probe," J. Am. Chem. Soc. 2012, 134, 16742-16752, DOI: 10.1021/ja306868r.